65/92 David Mumpower I'm a cat person. 'Nuff said. 94/126 Kim Hollis Ugly animation but a clever sceenplay. They don't balance that well, though. This odd-looking animated flick is based on an Emmy Award-winning Saturday morning television series that aired on ABC from 2000 to 2002, with repeats now being aired on Toon Disney. Teacher’s Pet is actually an educational cartoon and was created by avant garde artist Gary Baseman. The show is based around a super-smart dog named Spot (Nathan Lane) who is so interested in the world that he teaches himself how to read. Soon, he is sneaking to school with his young master Leonard Helperman (Shaun Flemming). 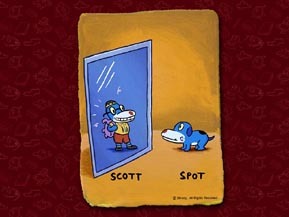 There, Spot poses as a human named Scott Leadready II so that he can even further develop his education. The director of the television show will make his feature film debut in the theatrical version of the show, which will apparently be a musical of sorts in that it will poke fun at songs from a number of other Disney films. According to early plot information, a vacation to Disney World may be involved, which could have potential for a lot of smart humor if the Powers That Be allow the show to keep its edge. Supporting voice roles will come from the outstanding David Ogden Stiers (Lilo & Stitch, Spirited Away), Wallace Shawn (Toy Story 2, The Princess Bride) and the inimitable Jerry Stiller (A Rat’s Tale).